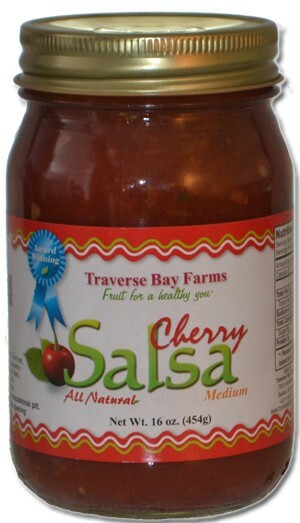 Cherry Salsa - Medium - Cherry Gift Ideas - Northern Michigan Gifts--Traverse City, too! Perfectly balanced combination of cherries, tomatoes and spices. *This item ships directly from Traverse Bay Farms. A Northern Michigan favorite for over 14 years. Combining Michigan cherries with tomatoes, onions, spices and more to create a great tasting cherry salsa.